Happy New Year beautiful people! Just pretend I said that on the appropriate day instead of today. A slight new year’s eve mishap with a high-end wine glass and a couple of verbs combined with a stubborn insistence on not spending this new year’s in the emergency ward with ne’erdowells.. made for an interesting (albeit painful) long weekend. I made and gifted a couple of aprons, spent an internet-free (and consequence-free fortnight in the country-if it’s not on Facebook, then it never happened) and then I hung out with velosewer (obviously the best part). We were so busy having fun and feeling up fabrics instead of buying them browsing for fabric that we didn’t bother taking any photos so you’ll have to take my word for it (and hers). Velo gave me a stack of omg classic Burdas (the nineties were an exhilarating ode to minimalism- and skorts). I’ll start with Burda International (Edit: yes this was available in German but this is not the same thing as Burda Mode) 02/95 because it has a playsuit (which I want to morph this pattern into-I’ve already made up the original, in this fabric and worn it heaps). It’s awesome and a total keeper (for re-makes) but I want a playsuit now. Special thanks to velosewer for providing the past part of this post. 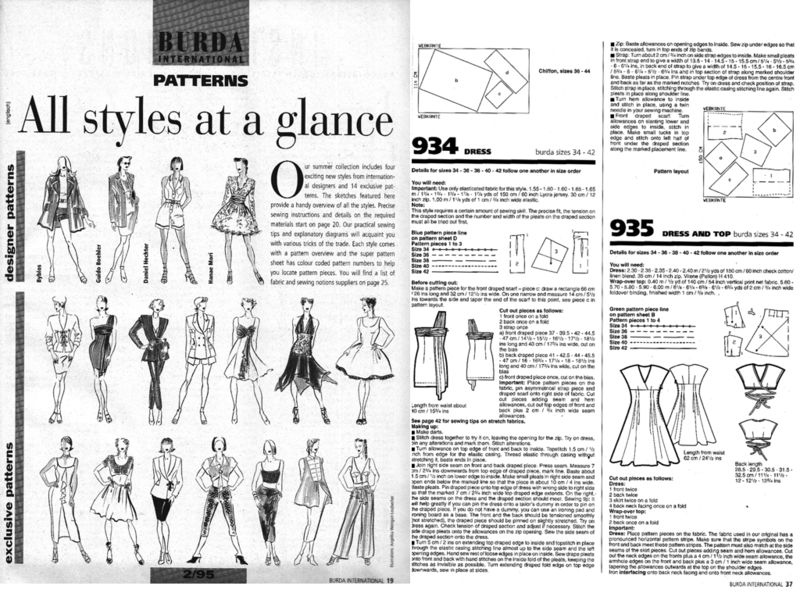 Back in the day (after the dinosaurs but before the ubiquity of pocket devices that could store your whole effing music library) Burda used to be a catalogue of designer styles with a sewing supplement at the end. Said sewing supplement was (dark) choc full of designer patterns most of which extended down to size 34 (which current Burdas rarely do, presumably to save the three extra micrograms of pigment that it would cost). Well feast your eye-drums on these because once you know something of this magnitude it’s impossible to un-know it. Ever. Burda used to cover haute couture. 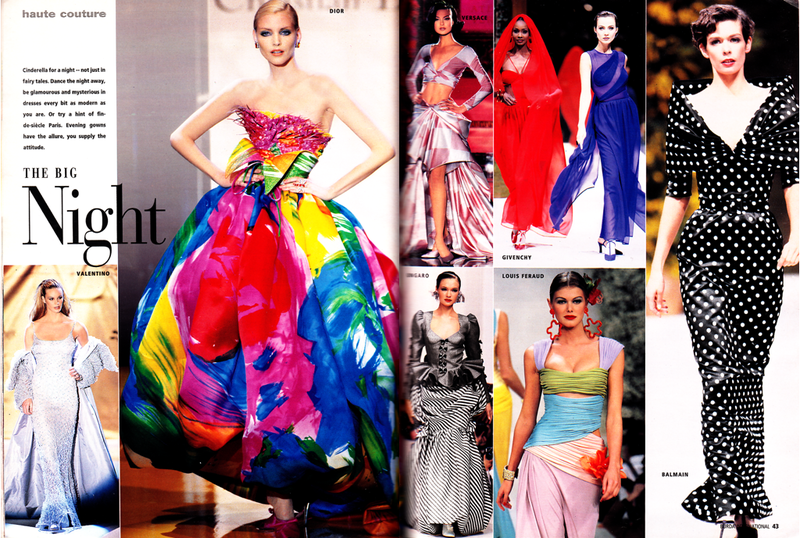 The Dior ball gown and the blue chiffon number by Givenchy are my favourites. That Lacroix gown-so 30s Hollywood noire. And swimwear-because why the hell not? The meat: fashion illustrations and line diagrams for all included patterns. Four designer patterns. Why did they stop doing this? Hanae Mori dress. Pattern for underskirt/ crinoline also included. Dana Scully, 90s heart-throb. Not really. But kinda. Some of the included patterns-they’ve done a repeat of that blue skirt recently.. 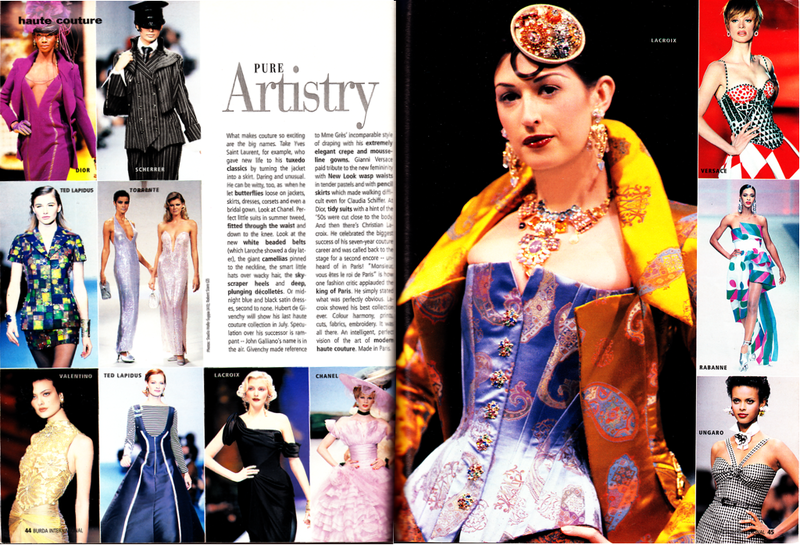 The magazine also includes lots of little articles on various designers including Ungaro (above, which my scanner has helpfully rendered invisible), DKNY, Madame Gres, Byblos, Daniel Hechter, and others. In short, Burda used to be the ultimate fashion magazine: haute couture catwalk summaries, articles focusing on designers, seasonal trend coverage and the patterns required to make the look. There were heaps of designer patterns and the size range was larger. So what happened? In other news Cathe of Amarylislog nominated me for the beautiful blogger award (thank you! ), Stefpulls (aka the PurkinjeNinja on twitter) is hosting a La Mia Boutique giveaway aaand I spent the rest of the break playing video games and reading webcomix (in bed, due to the afore-mentioned freak accident). Disclaimer: All images remain copyright of their respective owners and are used here for purposes of illustration and discussion.